(Nanowerk News) The detection of endothelial progenitor cells (EPCs)—specific biomarkers for vascular diseases that exist at low concentrations in blood—is a time-consuming process that requires large blood-sample volumes from patients. 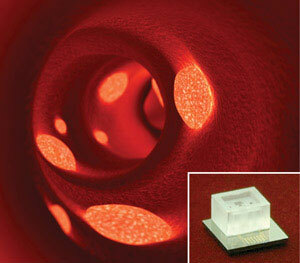 To reduce patient discomfort and delay in vascular disease diagnosis, a team led by Yu Chen from the Institute of Microelectronics of A*STAR, Singapore, has developed a microfluidic device that rapidly detects low EPC levels in blood-cell samples ("Label-free impedance detection of low levels of circulating endothelial progenitor cells for point-of-care diagnosis "). The researchers adapted a gold microelectrode array (MEA), previously employed in cell attachment studies ("Real-time monitoring approach: Assessment of effects of antibodies on the adhesion of NCI-H460 cancer cells to the extracellular matrix"), for their EPC detection device. A unique configuration of horse-shoe shaped microfabricated electrodes concentrates EPCs at the center of other, disk-shaped electrodes through a technique called negative dielectrophoresis. Measuring the impedance between the horse-shoe shaped and disk electrodes allows the device to spot EPCs and determine their concentration. “The electrode design combines both impedance detection and negative dielectrophoresis functions—which is different from approaches proposed by other researchers,” says Chen. The researchers modified the array by depositing a layer of organosulfur molecules on the gold electrodes through self-assembly. Then, they fixed a microchamber comprised of a well flanked by two holes serving as fluid inlet and outlet to deliver blood samples onto this array. Finally, they tethered EPC-selective antibodies to the self-assembled monolayer to create EPC-specific MEA chips. Fig. 1: The endothelial progenitor cell detection chip (inset) could be used in the assessment of plaque build-up in blood vessels (main image). According to Chen, they needed antibodies that specifically bind EPCs because the target cells are mixed with peripheral blood mononuclear cells (PBMCs) in the sample. Therefore, they loaded the sample in the open microchamber and removed the non-specific PBMCs through a washing step while keeping the EPCs on the electrode. EPCs assist the repair of blood vessel linings by differentiating into vascular endothelial cells. They also enhance the efficiency of stents—tubes inserted into blood vessels—to prevent the accumulation of plaque on arterial walls, which restricts blood flow to the heart. This microfluidic EPC detection system may be helpful for cardiologists to assess the need for stent implants in patients and determine if stents work properly (Fig. 1).